Story by Shannon Wianecki. Photos by Elyse Butler. Francisco de Paula Marín likely grasped the gravity of what he’d witnessed. As adviser and personal physician to Kamehameha I, he’d been summoned to Kailua-Kona earlier that year to attend to the dying monarch. Before he passed, Kamehameha named his son, Liholiho, the new king, and his favorite wife, Ka‘ahumanu, queen regent. Ka‘ahumanu knew that as a woman her ability to rule would be constrained. A complex system of religious kapu (prohibitions) denied her entry to the heiau (temples) where men discussed strategy and offered sacrifices to the war gods. She, along with every other Hawaiian wahine, was forbidden to eat with men and could not even partake of foods reserved for men, such as pork or bananas. So, following the death of her mighty husband, Ka‘ahumanu moved to break the rules that bound her. She invited her nephew, now King Kamehameha II, to sit down with her and eat. For a few months the young man avoided her. He knew the consequences. Finally, on that fateful November day, he joined her at the table. John F. G. Stokes was arguably Hawai‘i’s first archaeologist. After joining the staff of the Bishop Museum in 1899, the young Australian spent years organizing collections and documenting the Islands’ many heiau. 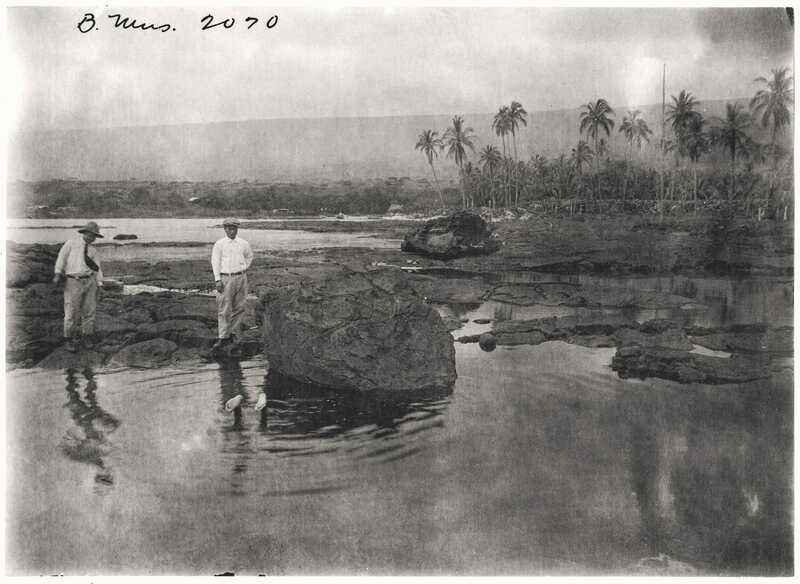 Here, an image taken by Stokes in Pelekunu valley on Moloka‘i in 1909. Four months after the ali‘i (royalty) abandoned the kapu system, the first Christian missionaries arrived in the Islands, ready to fill the void. The decades that followed were among the most tumultuous in Hawai‘i’s history. Foreign ships came on a flood tide, carrying everything from small-pox, mosquitoes and rats to capitalism, landownership and literacy. By the end of the 1800s, Hawai‘i’s monarchy had been overthrown. What remained of the ancient religion was kept private, passed down through families. The heiau had burned, but their stone foundations remained. In August 1906 a young Australian named John F.G. Stokes packed a camera, tripod and survey equipment onto a mule and set out across the Kailua-Kona lava plains. His assignment—to scientifically document the island’s heiau—proved daunting. Across a vast landscape of still-active volcanoes, he encountered scores of sacred sites, rock walls and platforms half buried under brush. Two weeks into his three-week assignment, Stokes wrote his boss at Bishop Museum in Honolulu. He’d found more heiau than expected and needed more time. William Brigham, the museum’s director, wrote back urging him to wrap it up. Stokes insisted, claiming he had an “un-made reputation” to defend and didn’t want to do half the job. Stokes was methodical, perhaps to a fault. Nevertheless, Hawai‘i’s first archaeologist was a pioneer in the field who brought leading technology to bear on ancient Hawaiian artifacts. John Stokes was methodical, perhaps to a fault. Nevertheless, Hawai’i’s first archaeologist was a pioneer in the field who brought leading technology to bear on ancient Hawaiian artifacts. Brigham had hired Stokes in 1899 to organize Bishop Museum’s library and collections. Shortly after the Aussie arrived in Honolulu, Brigham had taken him on a field trip to Puna, on Hawai‘i Island. The men camped at one of the most significant heiau in the archipelago: Waha‘ula, a massive stone compound said to have been built by the legendary priest Pā‘ao. Stokes took careful measurements of Waha‘ula and later fabricated a scale model, which is still on display in Bishop Museum’s Hawaiian Hall. At the time, all knowledge concerning heiau came from oral histories collected by nineteenth-century writers: John Papa ‘Ī‘ī, Kepelino, David Malo, Samuel Kamakau and Abraham Fornander, among others. A few early visitors to Hawai‘i had produced sketches of heiau, but no scientific studies had been conducted to confirm or augment the many mo‘olelo (stories) told about them. Archaeology itself was a new science, having just made the leap from hobby to professional enterprise. When Brigham promoted Stokes to “Curator of Ethnology” in 1903, it was the first archaeological post in Hawai‘i—possibly the first in the Pacific. Stokes joined the Hawaiian Historical Society, where he met Thomas Thrum, a fellow Australian, amateur archaeologist and prolific publisher. The men traded notes; Stokes surveyed sites, and Thrum published the data in his annual almanac. Thrum provided Stokes with a checklist of a few dozen heiau to look for on Hawai‘i Island; Stokes later expanded that list to well over one hundred. The term “heiau” applies to any place where sacrifices or offerings were made, from single upright stones to massive, terraced temples encompassing several acres. Powerful ali‘i dedicated heiau to war, agriculture, healing, hula and even surfing. Large heiau indicated healthy population centers and incorporated many elements: houses for eating and sleeping, places for women to retreat during their menses, workshops, recreational areas and tombs. The thatched buildings and carved ki‘i (sacred images) that adorned the heiau had long since vanished by Stokes’ time, but the stones could still tell stories. The staff of Bishop Museum, circa 1900: William Brigham, the museum’s director, is front and center; John Stokes is on the far right. Brigham wanted Stokes to investigate the roots of Hawaiian religion—not merely what transpired a hundred years ago, but a thousand years ago. He particularly wanted to test one of Fornander’s theories: that Hawaiian temple construction changed demonstrably in the twelfth century with the arrival of Pā‘ao. The powerful priest from the South Pacific was credited with introducing severe kapu, human sacrifice and the huge, walled luakini heiau where these sacrifices took place. Stokes pursued this quest over five months, circumnavigating Hawai‘i Island and documenting its historic features. He took precise measurements with an optical transit and produced detailed maps, sketches and photographs from glass-plate negatives. He hauled his cumbersome gear by mule, foot and, in hard-to-reach places, canoe. His wife Anna Margaret joined him on this and future assignments; his dog sometimes tagged along, too. On top of that, Stokes didn’t speak the local language—literally or figuratively. He made an unfortunate blunder in Ka‘ū —the very place where he might’ve gathered vital information. After traveling all day across an arid lava desert, he arrived after dark at Ka Lae, the southern-most point of the island and a region where tradition still held fast. There he found a dozen fishermen cutting and salting ‘ōpelu (mackerel scad). There wasn’t any grass for his mules, they told him, nor any water to drink aside from some rainwater at the lighthouse keeper’s cabin. Stokes proceeded to the lighthouse. Along the way he spotted a small heiau. Back on O‘ahu, Stokes had better luck gaining the trust of a janitor at Bishop Museum. The man shared invaluable information about three fish traps in Pearl Harbor: their names, associated rituals and which fish were caught within their lasso-like rock walls. The US military planned to expand the harbor, which meant destroying the traps. Before construction started, Stokes took photos of the traps, drew diagrams and typed up the janitor’s recollections. This was the first recorded salvage archaeology effort in the Pacific. Stokes logged another record for Hawaiian archaeology on a trip to Kaho‘olawe: the first stratigraphic excavation. At Kamōhio bay he unearthed a fishhook work-shop that dated back many generations. “With the care used in excavating Pompeii: everything was passed over a quarter inch sieve,” Brigham later bragged. The excavation yielded two thousand fishhooks, coral rasps and even “awa chewings.” This significant find emphasized archaeology’s value in determining the time frame of human habitation in Hawai‘i. The Kalalea heiau sits right on the cliff at Ka Lae in Ka‘ū, the southernmost district of Hawai‘i Island. Kalalea is a fishing heiau, a fact referenced by the marginalia Stokes drew alongside his inked plan showing the heiau’s layout. Stokes went on to survey all of the main islands, particularly Moloka‘i. He prioritized heiau but also documented fishponds and petroglyphs. To better acquaint himself with Hawaiian history—and avoid gaffes like that in Ka‘ū—he learned to read Hawaiian. He consulted the works of Malo and Kamakau, regretting that he hadn’t done so beforehand. Ultimately he was able to discount Fornander’s theory: Heiau architecture didn’t shift dramatically after Pā‘ao’s arrival. “After examining about 150 heiau sites on the island of Hawaii, about 70 on Molokai, and several on the islands of Kauai, Oahu, and Kahoolawe, it seems to me that a man would be very unwise to attempt to draw a plan of the Hawaiian heiau. The endless variety in size, shape, and form puzzled me exceedingly until I reread Malo’s description.” Malo maintained that individual kahuna determined the form of each heiau. Stokes’ research supported this theory. One of Stokes’ most useful contributions proved to be his research at Hōnaunau. 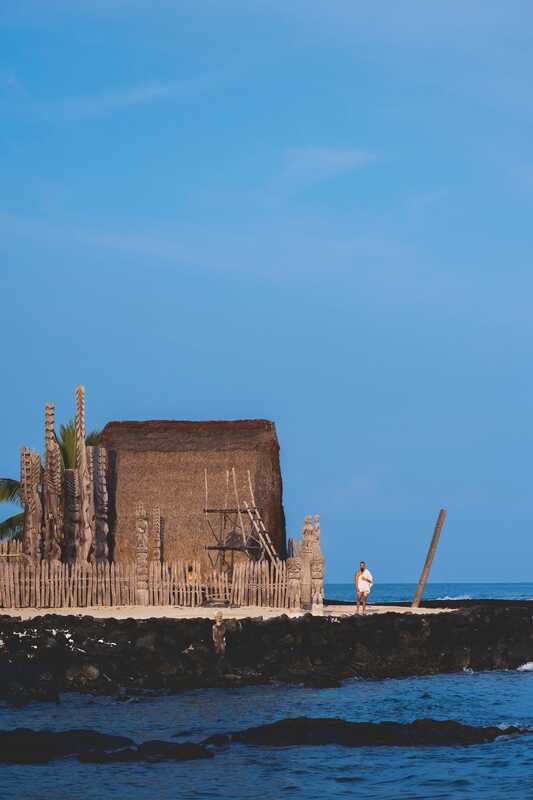 The serene South Kona oasis was initially spared when Ka‘ahumanu and Liholiho razed Hawai‘i’s other heiau—undoubtedly because it contained Hale o Keawe, the royal mausoleum. It also possessed distinction as a pu‘uhonua, or place of refuge. For centuries, certain heiau throughout Hawai‘i served as havens for maka‘āinana(commoners) who broke kapu, or for women and children fleeing war. Pu‘uhonua o Hōnaunau is the largest and best preserved of these sanctuaries, and Stokes played a key role in its revitalization. The mana is palpable. Pu‘uhonua o Hōnaunau is one of few places where people can experience what ancient Hawai’i might have looked and felt like. A profound serenity still permeates Hōnaunau. The area’s natural abundance is obvious: Sea turtles nap on the shore, native sedges fringe the freshwater ponds and yellow tang dart among corals in the bay. Today this ancient refuge is a national park. Kahakai‘o Ravenscraft is one of the park rangers who bring Hōnaunau’s history to life. On any given day he can be found carving traditional implements in the shade of the thatched hale wa‘a (canoe house). His name, Kahakai‘o, means “perch or circling of the hawk.” “I’m the one who always has his eyes on the site,” he says. The mana is palpable. 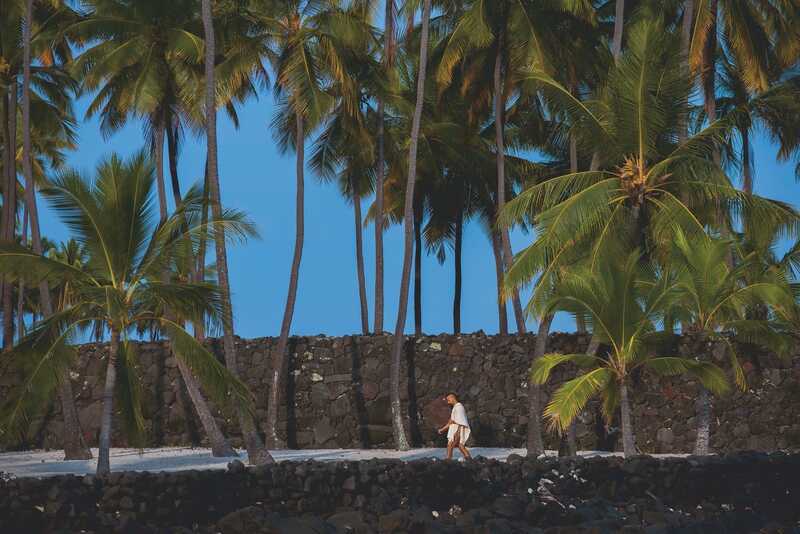 Pu‘uhonua o Hōnaunau is one of few places where people can experience what ancient Hawai‘i might have looked and felt like. When the National Park Service sought to restore this 440-acre site in the late 1950s, it turned to Bishop Museum for guidance. The museum’s anthropology department produced a thick volume detailing Hōnaunau’s natural and cultural significance. Stokes’ notes from four decades prior formed the backbone of this report. When it came time to reconstruct Hale o Keawe, the park commissioned a local woodcarver, Antone Grace. It turned out that Grace’s family had maintained the heiau grounds for generations. He possessed information beyond the archaeologist’s grasp: carving techniques and traditional practices. He carved a collection of enormous ki‘i for the temple and passed his knowledge on to future carvers. Keoni Fox (left) and Lahela Kamaka are the newest caretakers of the Kukuianiani heiau on O‘ahu. Fox inherited the property from his grandmother and Kamaka is a descendant of the heiau’s last practicing kahuna, Kaukukala. “I got to learn from the ‘ohana [family] who was caretaking this place,” says Ravenscraft. He was born after Grace had passed but counts Grace’s nephew Shane Nelson as a mentor. They both belong to the ‘ohana group that guides the park in perpetuating the site’s cultural and spiritual integrity. That includes replacing ki‘i as needed and performing traditional rites. During the four-month makahiki celebration, they dress Hale o Keawe with white cloth and flags and place offerings on its tall lele (altar). Hale o Keawe was a bare platform when Stokes arrived in Hōnaunau in 1919. He spent four months here, excavating and restoring ruins and interviewing locals. Considering the site’s wealth of artifacts, it’s likely he wanted to stay longer. Most impressive is the Great Wall, an L-shaped boundary that encloses the peninsula. Nearly one thousand feet in length, twelve feet tall and eighteen feet wide, it dates back to the 1500s. A path now cuts through its center, allowing park visitors to appreciate just how massive it is. According to legend, the Great Wall was built in five days. Stokes confirmed that this could be true, if seven work crews had labored simultaneously—which his research indicated. He also discovered that the wall was partly hollow. Its ancient builders had laid lava slabs in tiers atop columns, leaving spaces between. Called pao (caverned), this construction technique saved labor and materials; it’s unique to the region of Hōnaunau. Beyond the confines of the wall rises a large stone platform, ‘Āle‘ale‘a. Stokes described this heiau as a “temple for pleasure, where the chiefs reclined and relaxed to look over the country or watch the hula.” An informant pointed out a natural spring where Keawe’s bones had been washed. A tidal wave had filled the pond with rocks; Stokes and his crew dug it out. He identified royal fishponds, saltpans, pans for curing fishnets and dying kapa (bark cloth), and a hōlua sled track. He determined that the Keōua Stone, a thirteen-foot-long boulder, had slid from its original spot, where tent poles had been bored into the lava. Keōua, high chief and father of Kamehameha I, reportedly slept on this stone while his men were out fishing. Nearby, another massive rock figures into a story about Ka‘ahumanu. After quarreling with Kamehameha, the young queen fled to Hōnaunau and hid beneath the rock. Her dog barked, revealing her hiding place to her pursuing husband. Stokes was ahead of his time. Nearly every archaeologist working in Hawai‘i today references his work. “He Inoa no Pi‘ilani” also mentions ‘Akahi Papa, the tongue of lava that juts into the ocean from the northeast corner of Hale o Keawe. According to Stokes, a white flag flew here, marking the entrance to the pu‘uhonua. It signaled to refugees swimming across the bay where they could safely land. Stokes’ manuscripts are full of such details. On Maui a resident named Nawahine showed him a large rock near Waihe‘e. It had a small cavity resembling a human foot, hence its name, Wawaekanaka, or “man’s foot.” Nawahine told him that “a certain chief was pursuing some soldiers to kill them, and in the chase, one of them got his foot caught in the rock—and there is the mark!” In Lahaina residents spoke of Wailehua, a heiau that had been buried under sugar cane plantings but still resounded with drumbeats on the night of Kāne. Among the sites Stokes surveyed is Pu‘uhonua o Hōnaunau, one of the most important heiau in Hawai‘i. On O‘ahu, Stokes visited a little-known site perched above Kāne‘ohe bay. Kukuianiani heiau sits at the foot of Pu‘u Pueo, with a commanding view of the bay and its barrier reefs. Stokes and Thrum likely visited Kukuianiani together; it’s listed in Thrum’s 1916 Hawaiian Almanac Annual as a healing center devoted to lā‘au lapa‘au, plant medicine. There isn’t much written about Kukuianiani. Thrum described it as having “the curious name of glass lamp.” Mary Kawena Pukui, a more authoritative source, translated it as “flickering light.” At the heiau’s southeast corner is a large stone with two smooth bowls worn into its surface. “This may have served as a place to leave offerings or gather water,” says Fox. “Water that doesn’t touch the ground is the most pure.” Stokes recorded many such cisterns throughout the archipelago. Kahakai‘o Ravenscraft is a caretaker at Pu‘uhonua o Hōnaunau and a descendant of Keawe, the seventeenth-century chief who built many of the structures there. Stokes might have written more about Kukuianiani. Unfortunately, much of his work remains unpublished, stashed in boxes at Bishop Museum. Perfectionism prevented him from finishing reports. When Brigham retired in 1919, the museum’s next director, Herbert Gregory, had little patience for what he considered procrastination. In 1929, after thirty years of employment at Bishop, Stokes was fired. Rather than stew into bitterness, he remained active in the Hawaiian Historical Society and founded the Anthropological Society of Hawai‘i. He died in 1961, shortly after contributing to the Pu‘uhonua report. Newspaper obituaries failed to acknowledge the breadth of his work. One referred to him as a librarian—the post he held at the very start of his career. In fact, Stokes was ahead of his time. Nearly every archaeologist working in Hawai‘i today references his work. Many of the sites he surveyed no longer exist: Waha‘ula was swallowed by lava. The Pearl Harbor fish traps were plowed under by construction. Others disappeared without notice.